Fall planting brings Spring color! The time of year to purchase and plant flowering plant bulbs in Minnesota is typically around mid-September to mid-October before the ground freezes. Tulips & Daffodils grow best in full sun in well-prepared soil with fast drainage. Avoid planting where water collects, or in locations that are prone to late frosts. As a general guide, plant in September or early October. The rule is to plant the pointed end up and 6-8 inches deep. When planting a grouping, take the extra care to plant at exactly the same depth; this ensures that they all will bloom at the same time. With a shovel, excavate soil to create a level-planting base. Set bulbs into the bed, fertilize, and then cover with excavated soil. When planting a lot of bulbs, dig large trenches instead of individual holes. Line up the bulbs in the bottom of the trench, and then fill it in with soil. 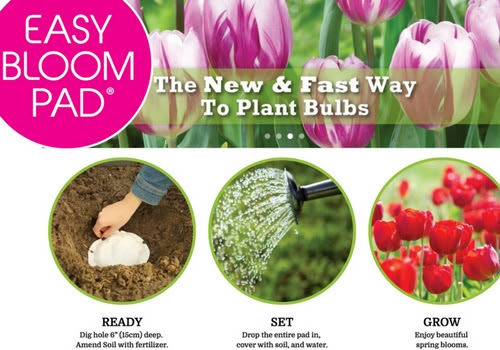 There are many helpful tools specifically designed for planting bulbs. Some make perfect holes by removing small cylinders of soil. Check out our selection of shovels and bulb planters. Firm the soil and water thoroughly after planting. Don’t water again until leaves appear. In cold-winter areas (zones 3 through 6), apply straw mulch about a month after planting. This gives the bulbs time to begin growth before the soil freezes solidly. The mulch also protects the bulbs if snow cover is light or nonexistent. Use Bone Meal or a low-nitrogen granular fertilizer specially formulated for bulbs, and follow label directions about the amount to apply. This should be done at the time the bulbs are planted or after flowering in the spring. Bulbs can be tricked, or forced, into flowering indoors. The bulbs must be potted into pots with drainage and good potting soil. A 6” pot holding 5-6 bulbs (which are not touching each other or the sides of the pot) is recommended. Place the pot in a refrigerator at 40º for 10-16 weeks then place it in a warm place and wait for the blooms. Look for varieties marked as good for forcing. We also carry bloom pads which are a simplified way to plant bulbs since they are grouped in bunches of 5 or 8 bulbs in a paper pan, which allows them to be planted all at once. By combining Early Flowering, Mid-Season and Late Season varieties, you can have blooms all spring. All you need to do: Dig. Drop. Done! Stop in today to one of our retail locations to browse our bulb selection in the Twin Cities and get yours planted before the ground freezes!